The tag line for The Witcher AG($5.99) says a lot. “The Witcher Adventure Game is CD PROJEKT RED’s board game set in the brutal, dark fantasy universe of monster slayer Geralt of Rivia!." I don’t know if its intentional that one hero gets top billing over the other three that are involved in the game, but after playing some rounds, I think we have a pretty obvious Mary Sue case on our hands. Geralt is the guy that right off the bat is best in combat. No one fights like Geralt, rolls his dice like Geralt, In a wrestling match nobody bites like Geralt. If you are ok with a slower start, the other characters are ok to play too though. The Witcher AG is a board game in which you are competing with up to 3 other players to finish a set amount of quests first. This number is set at the beginning of each game. The winner is the individual with the most number of points once someone completes that number of quests. Points are accrued in various ways including defeating monsters, accepting and completing side tasks and of course, completing quest objectives. Your character develops over time, gaining new abilities and sustaining injuries along the way. Resting is required to recover from injuries and will delay the speed at which you complete quests and gain victory points. 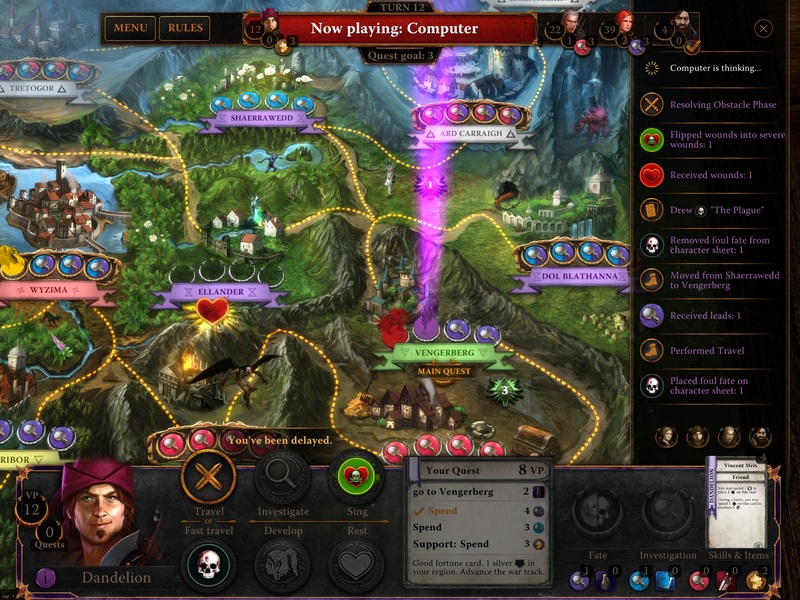 As turns pass, the difficulty of the game begins to ramp up. Monster spawns become more dangerous with more dire consequences for a failed battle. Defeating monsters is a dice rolling affair in which you usually must meet both an attack value and defense value with the same roll of dice. At the start of the game I feel like Geralt is probably the most proficient at combat, with the other 3 characters requiring considerably more luck in order to successfully defeat an opponent. Heavy investment into development will eventually level the playing field and creates a pretty decent balance after a while. This PC port has some peculiar issues not usually seen with a game that seems to boast high production qualities. Lack of a true tutorial and reports of lag(at least from some accounts and my own iPad 3) are concerning. The inability to save a game in between gameplay sessions is especially strange. I can see how slow performance and the lack of a save could impede someone from getting into this game. I didn’t let it really stop me but it was definitely worth note. The Witcher AG has some components of various types of board games that don’t really capture the qualities that make them functional and intriguing in other games. When I play Ticket to Ride($4.99), there is a thrill and excitement about the risk and reward involved in choosing different courses. I know that if I make the wrong choice I might end up scoring too few points or I may end up having them count against me if I fail to complete. 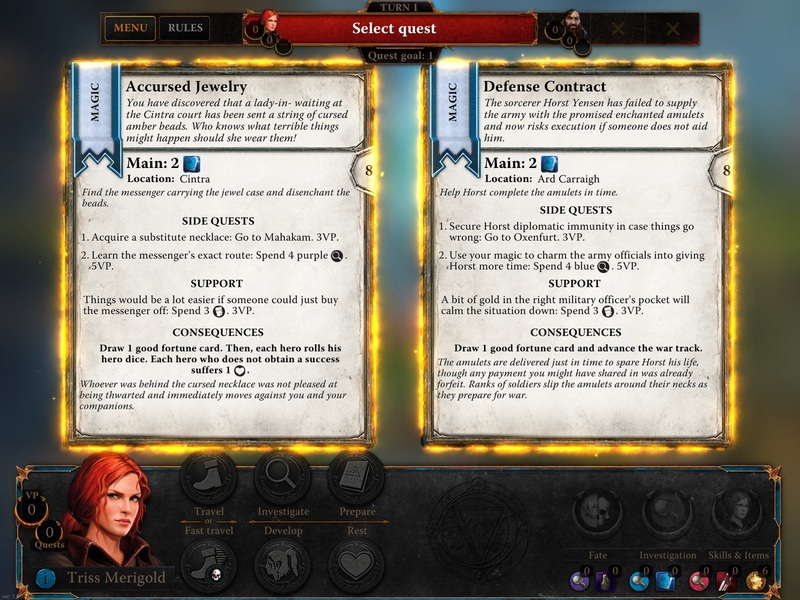 The analogue to Witcher AG is the quest system, which has very little penalty for choosing the highest cost quest as you do not suffer a negative from not completing. Another mechanic that just seems shallower than in other genres is the action system. Actions are a little bit like worker placement, with up to 6 selectable actions and only 2 action points per turn you get a bite sized taste of a system that in other instances, one of my favorites being Lords of Waterdeep($6.99), really takes the concept much deeper. In The Witcher AG, you have a number of systems that are basically just a thin veil over semi-random occurances. The biggest draw of the game is the fact that they have actually incorporated these systems, along with 4 different character classes and dice rolling mechanics into a game that surprisingly enough didn’t turn into Bamboozled. At each step, you are given at least enough information to know what you need to do to succeed and progress. Maybe I play too many board games, but I never felt lost even if I wasn’t given each and every bit of info that maybe I should have gotten. I like The Witcher AG. It took maybe a few too many systems but managed to wrangle them under their pre-existing universe to keep a thematically consistent experience. The ramping difficulty unnecessarily lengthens all but the shortest duration games, but the overall gameplay gives you just enough control over random elements that most board gamers won’t lose focus. It’s an exercise in excess that tumbles unceremoniously over the finish line in a genre where many contestants don’t even get half way. My most wanted improvements would include performance optimizations and a save feature. Pick it up if you have a good attention span.